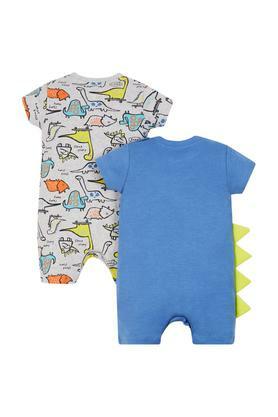 Give wings to the fashion skills of your child by making him or her wear this pack of two rompers from Mothercare. One of these come in a printed pattern while the other one featuring an applique pattern that is further complemented by a round neck and short sleeves. Besides, they will provide him or her with optimum comfort as it is crafted with care using superior quality fabric. Tailored with care using a premium quality fabric, these rompers will keep your kid at ease for long hours. Let him or her wear them with a pair of pump shoes for any casual occasion.